Dean McCullough has urged the County Armagh players to maximise next week’s Milk Cup tournament towards securing a future in football. Fifteen boys from the area have been included across the two 18-strong panels as the Orchard County players prepare to face touring teams from Ghana, New Zealand, Colombia, Spain and England. The Junior and Premier squads have been developed over a number of months with a view to entering next week in peak condition. McCullough, the County Armagh Milk Cup Association chairman, considers the preparation the perfect platform to help each player achieve his individual goal. 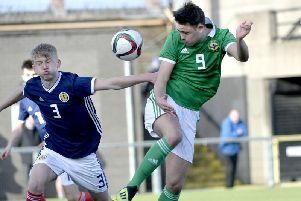 “It is a chance for players to get a taste of professional football for one week in terms of the scale of the competition and whole atmosphere,” said McCullough. “It is about approaching everything with that professional mindset and we have worked hard to emphasise that to the players so they can really grab any opportunity. “We have seen in the past few seasons with players like Aaron Duke and Shayne Lavery how the Milk Cup can lead to moves across the water. “Others become part of the Irish League scene, with recent examples Shea Conaty, Jordan Lyttle , Christian Stewart and Marcio Soares. “Irrespective of what the next step is, the Milk Cup provides lasting memories. “As a father of two former players and now the County Armagh chairman, I have seen what the competition means and passionately believe in the Milk Cup. McCullough is the head of a team that includes three former Portadown players - Pat McGibbon, Kris Lindsay and Andy Smith - on the coaching panel. Portadown-born Johnny Pollock is the goalkeeper coach.